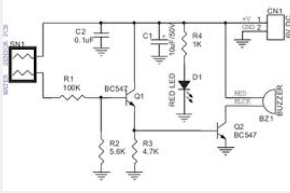 This is the circuit of a simple buzzer corrosion free water level indicator for home and industries. This circuit is very simple because it uses only two transistors and some passip Components are easily found circulating in the electronics stores. When the water reaches the sensor, BC548C Transistor base is connected to the positive terminal. In consequence the transistor is opening and the buzzer it makes a buzz. Function: In the water level indicator, buzzer will be activated in order to make a noise when a certain level of water is being reached.